A wheelchair and computer screen stolen from a north Belfast charity last week have been returned. Hundreds of presents have also been donated to the 174 Trust after thieves broke into its premises last weekend. The Duncairn Avenue charity, which works with disabled children, has been the target of several attacks in the last six months. However, staff have said the response to the latest break-in has been "overwhelming". 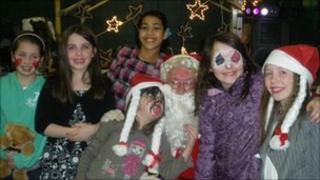 Presents for the children's Christmas party were stolen twice this winter. Stones have also been thrown at the building and the children, who have also suffered verbal abuse from some local youths. On Wednesday night, the party went ahead, thanks to a mountain of gifts donated from local people and staff from organisations including Marks and Spencer, the Ulster Bank and Newtownabbey Borough Council. Two women even drove from Portaferry, County Down, to deliver home-made cupcakes. "It's unbelievable, it's overwhelming," disability co-ordinator Linda Duffy said. "Every time somebody comes to the door, they give you a hug and tell you you're in their prayers and they're bringing in toys, I find the whole thing very emotional. "When I think of what we're went through over the last six months, it's heart-warming." Belfast mayor Pat Convery, who attended the Christmas party, said it had been an excellent response from the community. "It shows that the people of Belfast will respond as and when they are called upon," he said. Trust director Bill Shaw said they were absolutely delighted that the stolen wheelchair and computer screen had been returned. "The wheelchair was definitely returned to St Vincent de Paul - someone, a lady, brought it back in. She said it was given to her by someone else," he said. "The screen we're genuinely not sure how it was given back or by whom. That's all we know at this point in time. "Both sets of Christmas presents, the original set and the replacement set are not going to be returned we're quite sure." Police officers and people from local community kept watch outside Wednesday's party to make sure it was not disrupted. Mr Shaw said the last six months had been the most challenging in his 12 years at the charity. "But the last two days have lifted everyone," he said. "We will survive and we remain as committed as ever to working with and for the community of north Belfast."